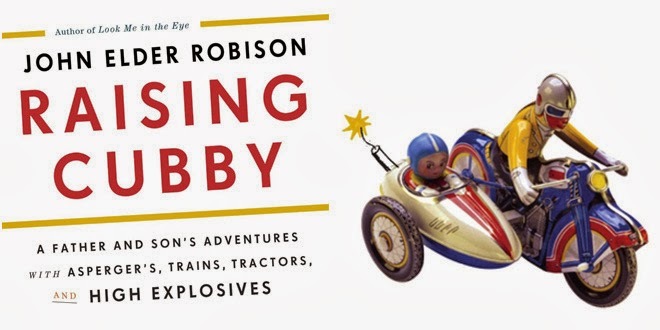 John Elder Robison's book Raising Cubby is a must-read for unabashed geeks and parents alike. His wry and affectionate memoir describes, in part, what it's like to be a late-diagnosed "Aspergian" raising a son who, it turns out, is also Autistic. 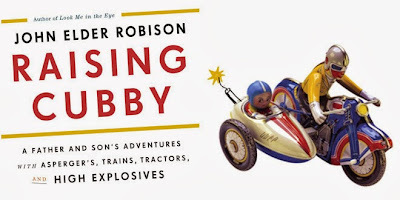 But the book's strongest themes are Mr. Robison's obvious delight in parenting, and his determination to help Cubby thrive (which he has) despite friction with the educational, and later legal, systems. We spoke with Mr. Robison about various elements of Raising Cubby, as well as his next steps as an advocate for autism science and research now that he has left the Science and Treatment boards of Autism Speaks. One of Raising Cubby's primary themes is Autistic parenting of Autistic children, which is not something we hear a lot about in the media. How common is it, in your opinion, for Autistic kids to have Autistic parents -- whether or not those parents are diagnosed? With all you read and hear about the hereditary nature of autism, I’m always surprised people ask that question. It’s always “some other family,” where the autistic dad has the autistic kid. Never yours. Or mine. To look at that more seriously, I think it’s common for autism to be concentrated with subsequent generations. My dad was less autistic than me. My son seems to have more trouble with organization and executive function. So maybe he’s more autistic. Maybe it goes the other way for the next generation. Or maybe not. No one knows. All we know (from legitimate scientific research, not just my own observation) is that autism in the parents is predictive of autism in the kids, just as having an autistic older son is predictive of younger kids having autism. When we look at our father’s generation – if they were functional enough to get a job – autism just would not be part of the conversation. Look at me. I had no idea what Asperger’s even was until my son was in second grade. Even then, it took some years for me to learn enough to realize he might have it too. What you read about in Cubby is not a knowingly autistic dad raising a diagnosed autistic son. You read about a dad who saw his own childhood failures acted out anew in his son, and a dad that tried to help that son based on his own life experience. Autism wasn’t a word we used until much later. I think that situation is very common, but not talked about either for reasons of ignorance, shame, or something else. Did the lack of such books -- Autistics parenting Autistics -- influence your decision to write Raising Cubby? I just felt it was time for a father’s story. 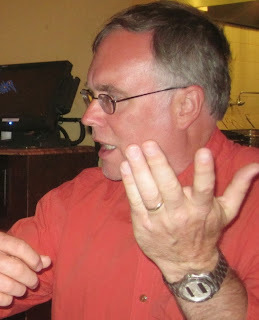 There are lots of mom memoirs but very few firsthand tales of fatherhood. I never really thought of Cubby as an “autism book.” Now that I see how different my style of child rearing was from the average dad I just thought I might have something useful to say to anyone raising a kid. After all, every dad wonders what to do with his kid on the weekend. Every parent wonders what to say when their kid says, “Where did I come from?? I answer all those things, and more. Do you have any specific advice for your fellow Autistic parents, in terms of dealing with neurotypical parents in social and other scenarios (school etc.)? When Cubby was little I sometimes had occasion to talk to parents of other kids. That was difficult for me because engaging them made me feel so different. Many of those parents were focused on “normal” jobs, where they worked a regular schedule, had vacations, and – most notably – got a weekly paycheck. I was a self-employed car mechanic with none of that structure. I always felt that they looked at me as some kind of alien creature. A few years later I began meeting people at day care, and then at Cubby’s schools. Day care was ok, because it felt like a big playpen. Montessori School felt much the same way. South Hadley public school felt awful – a rigid, strict place with authoritative teachers who did nothing to garner respect from me. I was not very successful at engaging either the parent or teacher communities when Cubby was little. I did not develop the ability to interact productively with either group until later, when I learned about autism and how it made me different. In those first years, I had no idea what those people expected of either Cubby or me. The whole time Cubby was little I watched other families and gathered the sneaking suspicion that there was a “normal way” to run a family, and my way. Every time I considered the “normal way” it just seemed too alien to my way of being. Yet I wanted to fit in. I just never figured out how. Now, I look back on those years with the benefit of considerable insight into autism and human behavior. There are many things I could have done different, to fit in better and possibly help Cubby better too. As for the final part of your question – I don’t think other parents played a big role in raising my son. In the early years I was never sufficiently connected to other parents for that to happen. Do “other parents” play a big role for neurotypical dads? I have no idea. When Raising Cubby, I looked at each problem, studied printed reference manuals, and made my best decisions to move forward. His appearance today proves my choices were wise and good. You seem like a really fabulous dad, with your excursions to the train yards and factories, and driving to those places in such fantastic cars. Was Cubby aware that most kids do not get to go on such adventures? Does he get nostalgic about those outings? Some dads take their kids to train yards to drive locomotives, while other dads chain their kids up in the basement while they go out and party. In both cases, the life they live is all each kid knows. While I can imagine the possible range of activities a parent and kid might engage in, I have no idea what a “typical dad” does. I based my decisions on what to do with Cubby on things that would be interesting to me. I assumed that he would like many of the same things I liked, and that proved to be true. At least until he got old enough to express objections. Even then, he remembered and learned from what I told him. For example, when he was five, I warned him about the monsters that live under the storm drain grates, out in the street. I told him to drop an occasional bit of food down the drain, just to be safe. And it worked. None of the kids on our street got eaten by monsters. Fifteen years later, I was proud to see Cubby talking to a little boy, out by the storm drains. “Drop some of your hot dog down the drain,” he said, “to feed the monsters under the road.” Alarmed and enlightened, the kid complied and The Knowledge was passed on to a younger generation. I also have no idea if he gets nostalgic. At age 23 few kids are ready to give their parents credit for all the fun things they did, and all the wonderful knowledge Dad imparted. You’d be better off asking him that in 20 years. One of your more striking observations was the need to consider the atypical developmental trajectory of some Autistic kids and their skills -- specifically with Cubby's reading. What advice would you give to parents frustrated or worried about their Autistic kids "catching up"? Well, it’s obvious that Cubby caught up. Look at him now. Look at old videos of me, and look at me now. That shows that we can keep growing and developing – and that’s not just getting fatter – even in our fifties. Look at Temple [Grandin] – she shows the same continued growth. There is no telling how far any particular kid will go, or how soon. Change is perpetual. I’m a big believer in the power of early intervention to help kids change, but in Cubby’s case he changed and grew without any sophisticated costly therapies. So did I. Other kids get hundreds of thousands of dollars in therapy and hardly change at all. I wish I knew how to predict what would work, for whom, and how soon. If I did I would make a fortune at the off track betting parlor and I would be relaxing on an island somewhere. Hell, I would own the island. Cubby's focused interest and expertise in chemistry and explosives led to your family being dragged into an extended legal battle. From an outsider's perspective, it seemed like the prosecutor's unwillingness to understand Cubby's autism and how it affected intent was a significant barrier to speedy justice. Is there anything you might have done differently to help the prosecution understand autism, in hindsight? No, because bringing autism into the trial would have been like conceding guilt, but asking to be excused because of autism. That was not the case with Cubby. The issue here was a morally bankrupt prosecutor who saw a chance to advance her career by convicting a geeky kid who seemed like an easy target. She chose major felony charges because they had (in her dreams) national news value. Not because they fit the actions. To convict a person of the felony of malicious explosion, the prosecutor must prove malice (intent to harm) and actual destruction of property (a car, a house.) The state totally failed on both counts. Autism played no part in our trial strategy. Cubby was not guilty of the offences charged. As one of my state trooper friends observed – we won it, fair and square. Having said that, I am aware that we beat long odds and innocence does not always carry the day. It’s truly every parent’s nightmare, to be caught in a system like that. You write about being disabled in Raising Cubby, whereas you had previously stated that you did not consider yourself disabled. Can you talk about how your thinking on the matter has changed? I didn’t consider myself disabled as a kid but I did think I was “less than other people.” How else would I be expected to feel, treated as I was with no explanation? People who read Look Me in the Eye say the early chapters are a portrait of a disabled child though I never felt that way myself. I don’t think I am disabled in the context of my day-to-day life now. But that is because I’ve constructed a world where I can be successful. I don’t know how to work in a big company, so I’m self-employed. My people skills are weak, but I have a business where I talk to machines. It’s hard for me to say the right thing in one on one conversation, but I build goodwill by letting my written words make the introduction. In those and a thousand other ways I shield myself from disability. Put me in a different life context and I might be very disabled indeed. Disability is often a result of the interaction between our abilities (or lack thereof) and the situation in which we find ourselves. People with autism often get less disabled with age as we accumulate a bigger and bigger base of adaptive strategies to help us cope with different situations. I talk in the book about certain things I can’t do, and when doing those things, I do feel disabled, and my performance is pretty poor. That might lead an observer to describe me as disabled in certain settings. But there are other situations where I do really well and I try to be in them most of the time. Ability and disability varied by the kind of task (sorting, calculating, imagining a story), the setting (noisy, quiet, bright, dark, etc.) and many other factors. Each of us has things we do best and things we don’t do very well. If the “not very wells” fall below a minimum threshold for our age you might reasonably call those traits of disability. If a person failed in work, personal life, or some other area because of those limitations he could be called disabled. That has certainly happened to me more than once but luckily its not happening right now. I try really hard to keep succeeding but I know the line between gift and disability is often razor thin. I don’t think this represents “changed thinking” on my part so much as it represents more evolved expression. You recently parted ways with Autism Speaks, stating that Autistics " ...are not problems for our parents or society, or genes to be eliminated. We are people." As your involvement with AS was focused on autism science and research, will you be less able to advocate in those areas? Or do you have other science and research connections that will allow you to continue that work on behalf of the Autism communities? The Federal government spends more than ten dollars for every dollar Autism Speaks spends on science and research. I’m still reviewing proposed science there; I can volunteer for more if I want. My service on government committees like IACC has given me a better platform to advocate for the kinds of therapies that will be truly beneficial to our population, at all levels. In the years since I joined the AS Science Board I have also joined many other significant initiatives. For example, I’ve volunteered for the CSESA advisory board. That’s a Dept. of Education funded project to improve outcomes of high school students on the spectrum. I’ve joined the steering committee for the World Health Organization’s ICF Autism Core Sets Project. I’m still very involved in science and research policy.